It sound easy but coming up with new and creative, exciting ideas for the playroom can often be daunting. Sometimes we do run out of idea. One of the mistakes a lot of parents (including us) make was to buy a lot of toys and props when the most exciting prop may actually be in the house. We learnt during the Son-Rise New Frontiers programme that we could use normal household items and even things we consider as junk to play in the playroom but I guess we were depending too much on the props we bought. 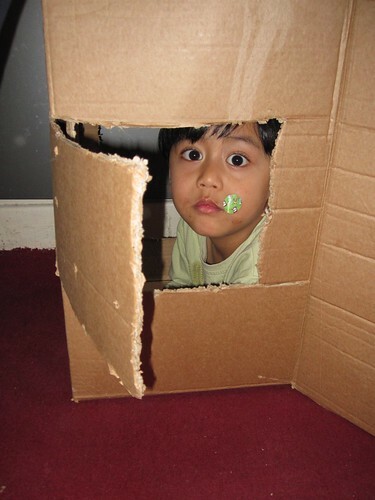 Anyway as it turns out my son and daughter had loads of fun with this old cardboard box. I don't know what he was thinking, but Imaan was probably imagining that he was in a tent or in a car or something.